The Help takes place in the early 1960s as the Civil Rights Movement is swinging into full momentum. African American women are often employed in white households as maids, nannies, and cooks, and the inequalities and prejudices of the time are painfully, exceedingly felt. The story centers around several women: Abileen, a black woman working as a nanny who essentially raises the children of white women; Minnie, Abileen’s friend and fellow maid, whose fiery temper, rebelliousness, and honesty often bring her trouble; Skeeter, an idealistic recent college grad who has returned home with dreams to write and a quest to discover what happened to her own beloved nanny, Constantine; and Hilly, the book’s fantastic villain, a young housewife who is hell-bent on maintaining and furthering the racial inequalities present in her town. What to say about the novel? Stockett writes beautifully, and you can’t help but to root for Abileen, cheer for Skeeter, laugh with Minnie, and gleefully hate Hilly. The novel is an absolute page-turner; just try to put it down. 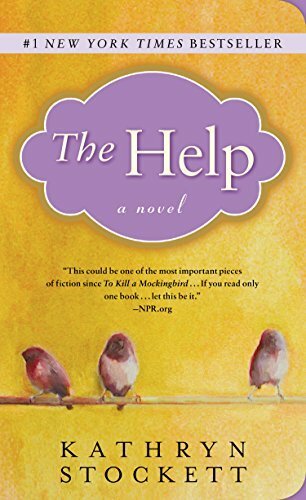 It was recommended to me in early 2010 by some fellow English teachers who had formed a book club of sorts; we had a meeting in the food court of a mall in Louisville, Ky, and even though we had all brought a book of our own to discuss, we ended up focusing on The Help (yes, it’s that good). My husband, so sweet and a fantastic listener, gifted me with a copy soon after, and I was completely hooked; as a result, my friends and students have heard me recommend this book far more times than they have probably liked! However, the writing is solid, the plot connects in sophisticated, surprising, and highly developed ways, the characters are genuine, and the message is moving: what else could a reader want? Stockett captures the time period in a realistic, honest, and absorbing way (and as a side note, the movie design is fabulous: take a peek at some awesome 60s designs here). After all, the author herself was raised by a African American nanny, which in my opinion adds a great authenticity to the novel. She’s gotten a lot of backlash for perhaps not totally representing the African American experience in an accurate or complete manner (she is white), but these critics need to be careful: are authors only allowed to write about individuals identical to themselves? I fear we would lose a lot of creativity and meaningful stories if this were the case. Regardless, Stockett has crafted a stunning story with vivid characters and a message that does in fact honor the bravery and perseverance of the participants in the fight for civil rights. I truly hope that Kathryn Stockett is not the next Harper Lee; in all her brilliance, Lee was only able to publish one novel, and I am on the edge of my seat waiting for Stockett’s next work. However, I do feel as if The Help will follow in To Kill a Mockingbird‘s footsteps in certain ways; both novels deal with racial inequalities in an exceptional, subtle, and heartbreaking way, both feature meaningful, endearing, and inspirational characters, and both will almost assuredly stand the test of time. If I am still teaching in 30 years, who knows: I very well might be teaching The Help right along with To Kill a Mockingbird. And that, I think, says it all.